This is one of my famous one pot wonder desserts. It is a very simple but effective dessert. If you want to get little individual tartlet dishes and make small tarts you just need to transfer the caramelised fruits to them and press a disc of puff pastry onto the top. Select a medium sized oven proof frying pan-preferably about 9 inches/23 cm. Meanwhile cut the apples and pears into 6 wedges. 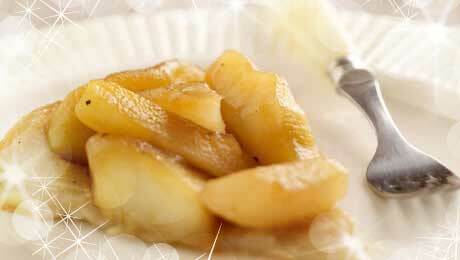 Squeeze a little lemon juice on the apples & pears to prevent them from darkening. In the frying pan, gently melt the butter and then add the sugar and stir continuously until the mixture begins to bubble and all the sugar has been dissolved. Add the apples and pears to the pan and cook gently for 8-10 minutes until they begin to soften - just slightly and they take on a nice golden brown caramel. Add in the ground cinnamon at this stage. Remove from the heat and allow to cool for a further 8-10 minutes. Meanwhile roll out the puff pastry and cut out a disc to fit the top of the frying pan. This will not be the same size as the bottom of the frying pan! When the apple and pear mixture has cooled slightly fit the disc of puff pastry onto the top of the caramelised fruit mixture. Secure it tightly. Transfer the pan to the oven and bake for 15-18 minutes until the pastry is golden brown. Remove from the oven and allow to set for 10 minutes. Serve immediately with freshly whipped cream and ice cream.